CEDAR RAPIDS, Iowa. Collins Aerospace has been selected by Lockheed Martin to provide avionics for NASA's new X-59 Quiet Supersonic Technology (QueSST) aircraft; Lockheed Martin is developing the X-59 in order for NASA to collect data that could make supersonic commercial travel over land possible through low-sonic-boom technology. Under the agreement, Collins Aerospace -- a unit of United Technologies Corp. -- will provide developmental engineering support to tailor its Pro Line Fusion avionics to the specific requirements of the X-59; as the companies jointly develop software applications side-by-side, it is hoped that it will result in an optimized solution which will include Collins' award-winning touchscreen primary flight displays with tailored multifunction windows, head-up display (HUD) symbology, synthetic vision, ARC-210 communication radios, and a suite of navigation and surveillance equipment. Lockheed Martin will institute a System Integration Lab for the Pro Line Fusion avionics at its Palmdale, California, facility. Collins will additionally provide a dual multispectral enhanced vision system (EVS-3600), due to the unique shape of the craft: In order to achieve supersonic speeds with a low sonic-boom signature, the X-59 must have a long and slender shape, which makes a forward-looking window impractical. The EVS-3600 will enable pilots to land in nearly all conditions, using advanced visual sensors leveraging long-wave infrared technology. 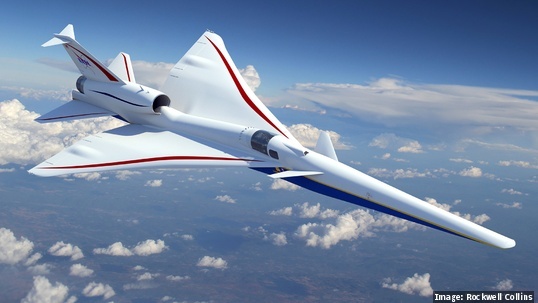 The X-59 -- designed to make a sound about as loud as a car door closing, instead of a sonic boom -- will be used to collect data on the acceptability of the quiet sonic boom generated by the aircraft, which will enable NASA to establish an acceptable commercial supersonic noise standard to overturn current regulations banning supersonic travel over land. The QueSST is expected to take its first flight in 2021.